It’s a holiday in most parts of Canada and here in New Brunswick it’s… well, New Brunswick Day. Hooray! Unfortunately it’s a bit too hot for us to want to leave the house, so luckily I have a ton of LEGO to build! Sitting on the floor building LEGO sets is as cool as it gets for me, figuratively and literally. I haven’t been building a lot of larger sets so far this summer, so I’m going to try and beef it up a bit this week. Today I thought I’d finally get around to building one of the only LEGO trains I’ve ever picked up. I’m just not much of a train guy, that’s my pal over at Twoloosebricks. I’m more of a general pop culture dude. It’s not that I don’t like trains, but they’re very low on my list of interests. I’ve only ever bought trains from licensed themes, because they end up on clearance and I’m cheap. This one was too sweet to pass up at more than half off. 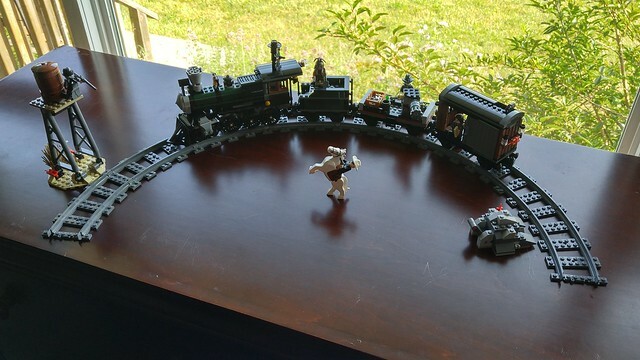 The Constitution Train Chase from The Lone Ranger. Crappy Movie, pretty nice sets. 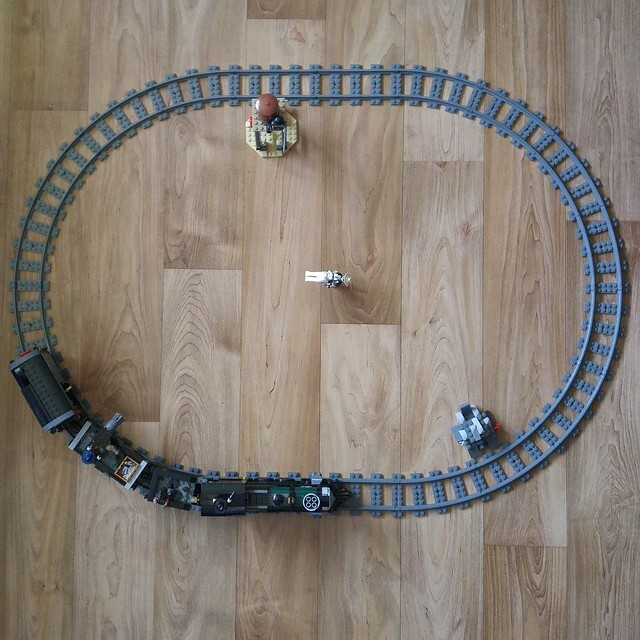 This is the first LEGO train I’ve gotten that comes with a full track set up. I even hauled out the two switch track boxes I picked up on deep discount and expanded it a bit after I took these. 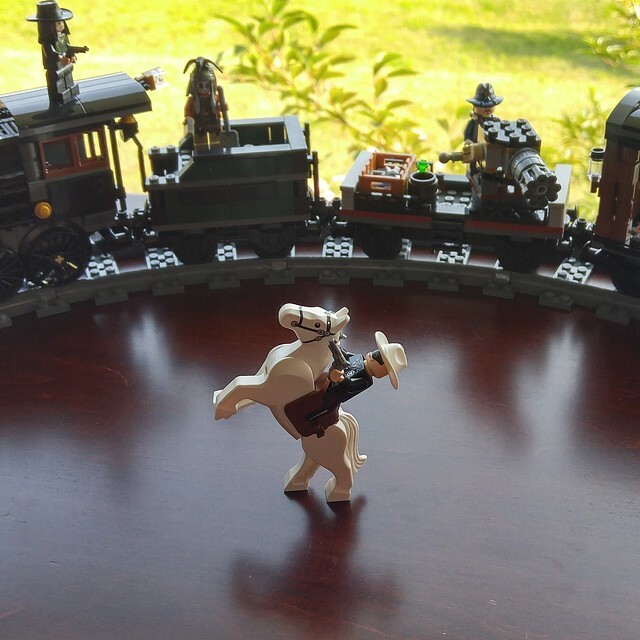 The movie might have been bad, but the Lone Ranger minifigure is perfect. You can ignore the fact that he looks like the movie version and just appreciate it as a fantastic generic Lone Ranger fig. Lots of good minifigures in the set overall. Every one would be incredibly useful in more generic scenes you might want to build. Whether you build Steampunk, Victorian, Old West or if you must The Lone Ranger, I think you’re covered. The train has tons of great parts overall and while I’ve only built a couple of trains, I thought the build was quite interesting with some cool techniques. The silver ingots are always welcome in my imaginary LEGO money bin. I really liked this set and my son and I spent most of the evening playing with it on the floor. Along with the decent Silver Mine set and the excellent Stagecoach set, I thought this was a great series and a worthy payback for the disappointing film.